Will this be the first year the hockey team wears Adidas sweaters? If so, or even if not, any idea what they could possibly look like. Anything information on them leaked yet. 2 lower bowl tickets Alaska Anchorage section 105 row R seats 11-12. $50 for pair for Friday. $50 for pair for Saturday. If interested text 218-686-5638. 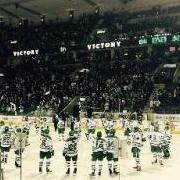 2 lower bowl reserved seats for sale for Sioux/Badgers, section 105, row R, seats 11-12. Tickets available for both Friday and Saturday nights. $100 for pair for either night. Text if interested 218-686-5638. 3 Tickets for Sale - Hawks vs. Wisconsin November 2nd!!! 3 Tickets for Sale - Hawks vs. Alaska November 23rd!!! 3 Tickets for Sale - Hawks vs. Alaska November 24th!!! 3 Tickets for Sale- Hawks vs. Denver December 8th !!! Curious to see people's thinking on this. I live in Omaha and am a UND fan. I have 3 tickets for the Friday, Feb. 16, game I am unable to use due to a conflict. I prefer to sell to UND fans. The seats are in Section 214, Row J 16-18 (aisle). I paid $35 per ticket and am only seeking the price I paid - $105. If interested, I will follow up with you. My roommate and I got into a discussion tonight and are trying to figure out does the student section say D-A-K-O-T-A Dakota Dakota Go Sioux! or is it D-A-K-O-T-A North Dakota Go Sioux! I originally thought it was the second way but at some point, someone corrected me saying it was the Dakota twice. Anyone know? Or is it a bit of both? Never hurts to get an early start. Two tickets to Saturday's Gopher game. Section 303, Row J, Seats 17-18 -- this is end UND shoots at twice. $400 for pair OBO. DM if interested. Open to any location as I know three together is tough to find. I need 2 or 3 for the Saturday February 4th game vs St Cloud. Feel free to contact me at six zero five 321 one three five three. Thanks for your help. Looking for (2) on Saturday. Lower level preferred. Suites will not be rejected Text 701-219-1392 .... Prefer Face Value and can barter.